Following on from my previous post, jackets are definitely a Spring staple for your wardrobe-check out what the Times Lisa Armstrong recommends. Blazers and smart jackets are so on trend for this summer and can be paired with jeans, dresses, trousers or skirts for a chic, stylish look-wherever you go. What is your season 'go to' piece? so lovely! hmmm, I have like a long white shirt I wear with my tanks. I don't dress up much. I'm afraid. 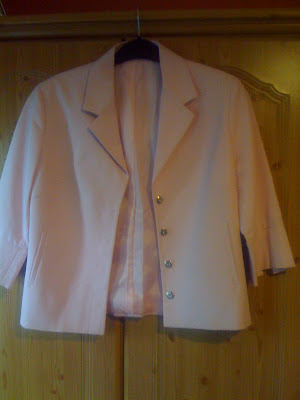 I have quite a few 3/4 length jacket which I will wear this spring as well. It is perfect for the weather. They are both very beautiful. love the pink blazer. Oh dear, something else I need! both are lovely, both perfect for the summer! hope you have a lovely weekend hun! Ohhh, I love both! Can't beat three-quarter sleeves for the spring, so feminine. Hmmm my summer go-to piece is always my cropped denim jacket! Thanks for the Marrakesh advice! I'm so excited! Hi everyone-thanks so much for the lovely comments, as always, so much appreciated!! 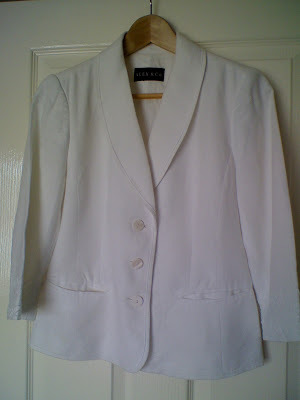 Very nice blazer, white is a classic!